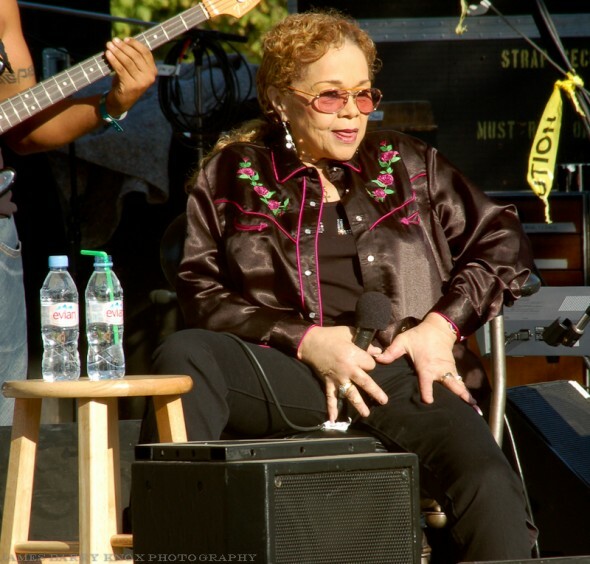 I took this photo of Etta James on very warm Sunday afternoon in September at the Russian River Jazz Festival in 2006. She was serving up her music hot and pulled no punches. This is how I will remember her. Two of my favorite Etta James releases were from the mid 90’s. She did an excellent album of jazz standards, Time After Time, and a tribute album to Billie Holiday, Mystery Lady: Songs of Billie Holiday. Both albums are fine examples of how Etta could sing anything exceedingly well. Rest in peace, Miss Etta James. This entry was posted on Saturday, January 21st, 2012 at 9:36 pm. It is filed under Jazz on the River, Special Feature and tagged with 2006, blues, Etta James, legend, R.I.P., Russian River Jazz Festival, soul. You can follow any responses to this entry through the RSS 2.0 feed.